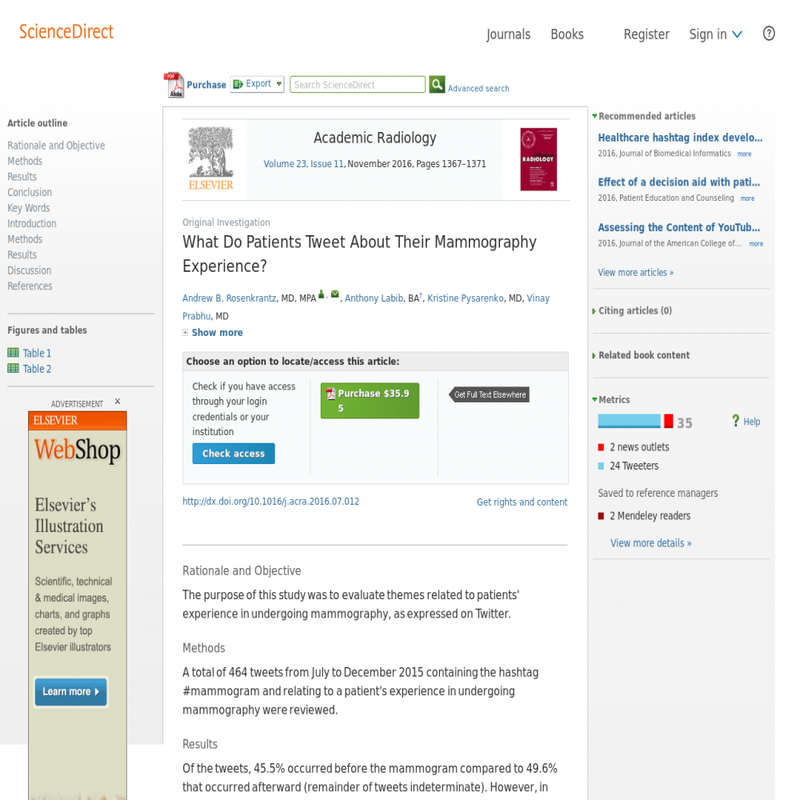 What Do Patients Tweet About Their Mammography Experience? The purpose of this study was to evaluate themes related to patients' experience in undergoing mammography, as expressed on Twitter. A total of 464 tweets from July to December 2015 containing the hashtag #mammogram and relating to a patient's experience in undergoing mammography were reviewed. Of the tweets, 45.5% occurred before the mammogram compared to 49.6% that occurred afterward (remainder of tweets indeterminate). However, in patients undergoing their first mammogram, 32.8% occurred before the examination, whereas in those undergoing follow-up mammogram, 53.0% occurred before the examination. Identified themes included breast compression (24.4%), advising other patients to undergo screening (23.9%), recognition of the health importance of the examination (18.8%), the act of waiting (10.1%), relief regarding results (9.7%), reflection that the examination was not that bad (9.1%), generalized apprehension regarding the examination (8.2%), interactions with staff (8.0%), the gown (5.0%), examination costs or access (3.4%), offering or reaching out for online support from other patients (3.2%), perception of screening as a sign of aging (2.4%), and the waiting room or waiting room amenities (1.3%). Of the tweets, 31.9% contained humor, of which 56.1% related to compression. Themes that were more common in patients undergoing their first, rather than follow-up, mammogram included breast compression (16.4% vs 9.1%, respectively) and that the test was not that bad (26.2% vs 7.6%, respectively). Online social media provides a platform for women to share their experiences and reactions in undergoing mammography, including humor, positive reflections, and encouragement of others to undergo the examination. Social media thus warrants further evaluation as a potential tool to help foster greater adherence to screening guidelines.